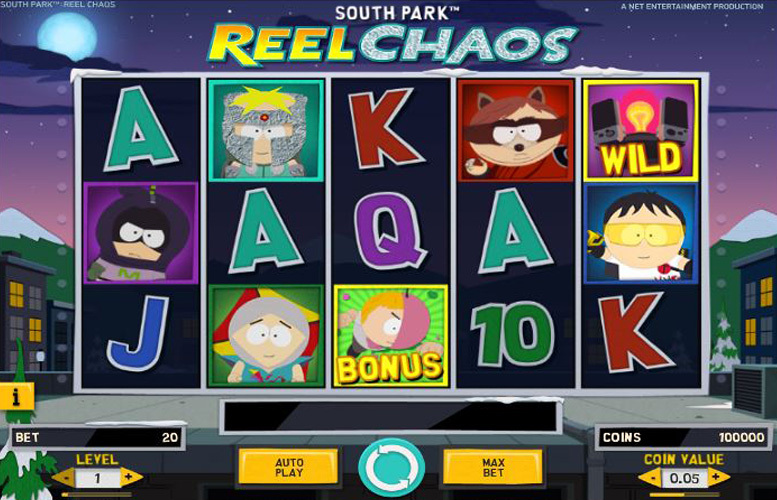 South Park: Reel Chaos is a five reel, three row and 20 payline slot game inspired by the popular American cartoon. The slot has a theoretical return to player percentage of 96.8%, offers players a choice between ten bet levels and six coin values and boasts a number of extra features. Those include wild substitutions, progressive bonus spins and a total of four random mini-features. Taking the characters and themes of cartoon South Park as its inspirations, South Park: Reel Chaos is an involved and interesting slot. Our comprehensive review will cover the game’s top jackpot, special symbols, paytable and betting limits, and can be found below. 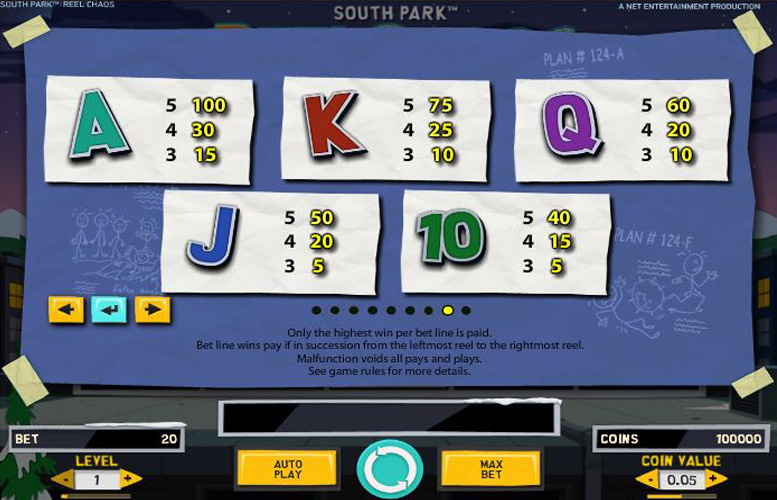 The mini-features and bonus spins of South Park: Reel Chaos introduce numerous ways in which players can win coins but the major source of winnings still remains the main slot game. In that game payouts result from combinations of three or more identical symbols lining up from left to right across the game’s 20 pre-set paylines. The most valuable combination of all is one made up of five ‘Mintberry Crunch’ symbols, which pays out at a rate of 1000 times the bet level for the spin. At the highest bet level of ten, therefore, that means a payline jackpot of 10,000 coins and an ultimate top jackpot of 200,000 coins if the combination appears across all 20 paylines at once. The maximum coin value that a player can choose is 50p and if that choice is made, the top jackpot is worth £100,000. 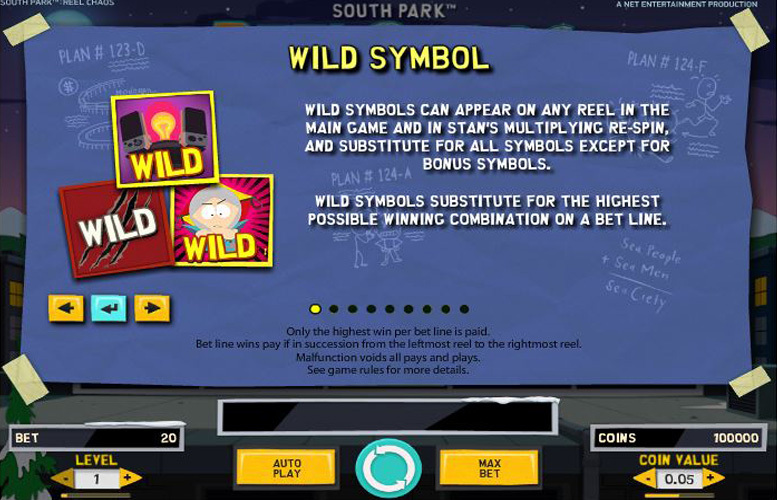 There are two different special symbols built into the South Park: Reel Chaos slot, in the shape of the Wild symbol and the Bonus symbol. Wild Symbol – wild symbols within the game work exactly like traditional wilds, in that they substitute for all symbols apart from the Bonus symbol and always go towards creating the most beneficial possible winning combination for any payline. Bonus Symbol – the Bonus symbols, meanwhile, are what activate the slot’s ‘Epic Bonus Spins’ feature. That feature is triggered when three Bonus symbols appear anywhere on reels 1, 3 and 5, and an immediate coin win worth five times the current bet is awarded. The spins within this feature are all played at the same bet level and coin value as the spin which activated the feature. The feature itself is then based around a fight between the game’s ‘Mintberry Crunch’ character and up to four different enemies. As part of the feature, both ‘Mintberry Crunch’ and the enemies have a health meter which can be decreased by one level either by a winning spin (for the enemy) or an unsuccessful spin (for ‘Mintberry Crunch’). Bonus spins end when either the health meter of the final enemy or of ‘Mintberry Crunch’ reaches zero and each enemy defeated increases the player’s multiplier from x1 up to a maximum of x4. Only the higher paying character symbols appear on the reels during bonus spins to improve possible jackpots and a victory bonus of ten times the initial bet is awarded if all of the enemies are defeated. Alongside the game’s two special symbols, South Park: Reel Chaos also includes four randomly activated mini-features. These features are called ‘Kyle’s Overlay Wilds’, ‘Stan’s Multiplying Re-Spins’, ‘Kenny’s Multiplier’ and ‘Cartman’s Stacked Wilds’, and each of them are explained in detail within the slot’s paytable. 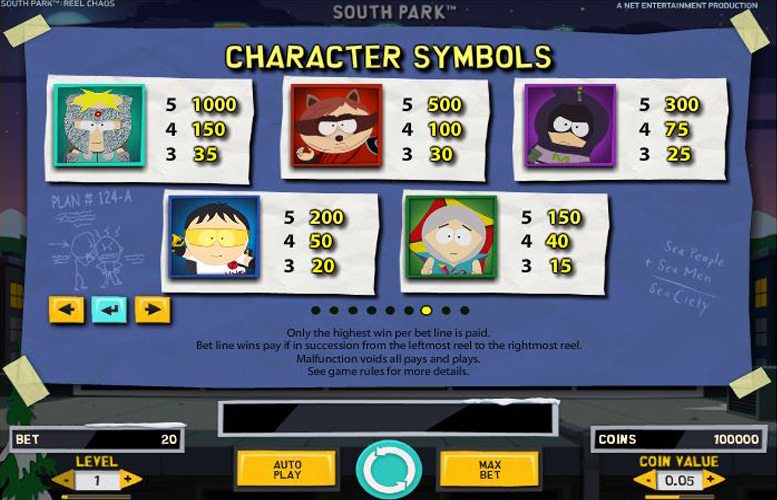 It is the character symbols which are the most valuable in this slot and as per the overall theme of the game, in South Park: Reel Chaos the South Park characters are dressed as their superhero alter egos. The most valuable symbol of all is the ‘Mintberry Crunch’ symbol and that pays at a rate of 1000 times the bet level for a five symbol combination. At the highest possible bet level, then, that means that a payline jackpot of 10,000 coins can be achieved and a total jackpot of 200,000 coins if the combination covers all 20 paylines at once. The second most valuable symbol is the one which shows Cartman as a superhero, and that symbols pays at a rate of 500 times the bet level. South Park: Reel Chaos players can control their stake amounts per spin by changing both the bet level and coin value. There are six different coin value alternatives from 1p to 50p and ten separate bet levels from 1-10, which determine how many coins are staked per payline. Taking the game’s 20 pre-set paylines into account, therefore, all of that means that the minimum possible stake per spin is a total of just 20p (one 1p coin per line) and the maximum wager is a total of £100 (ten 50p coins per line). One of a number of games which take their inspiration from TV shows, South Park: Reel Chaos is a slot which has plenty of endearing features. These include a comparatively generous top jackpot, loads of extra features and bonuses and a good degree of player control over betting amounts. The top main game jackpot of 200,000 coins is worth £100,000 at the maximum coin value and that is unquestionably one of the better top jackpots around. Ten bet levels and five coins values, too, gives a degree of control over stake amounts that at least matches the majority of other slot game options. Players who like added features and bonus games, too, will enjoy this particular slot that has no fewer than four mini-features and a progressive bonus spins element which can really boost jackpots too. This game has a rating of 3 / 5 with 234 total reviews by the users.